Once in a while, a gadget comes along which somehow manages to tug at our heartstrings, even though we know that in reality, it’s just a clever combination of robotics and Artificial Intelligence. Sony’s newly released Aibo puppy is just one of those gadgets. Sony originally launched its robotic dog Aibo back in 1999, fast becoming one of its best-known products, before being discontinued in 2006 due to a lack of sales. Now, Sony has announced that this iconic dog is being re-released after a significant update to both the technology and appearance. The new Aibo was unveiled at the Consumer Electronics Show in Las Vegas on January 8, after Sony announced that they would be opening pre-sales for the puppy on November 1. Before you get too excited though, the puppy is currently only available to buy in Japan. Aibo can change its behavior depending on who’s playing with it, just like a real dog might be gentler with a toddler than when playing with a teenager. Aibo achieves this ability using a camera located in its nose, which allows it to identify who it’s interacting with. This camera also helps Aibo to become more familiar with its new home, and allows it to take photos. It’s clear that Sony invested in some pretty amazing animation technology in order to imbue this robot with a real sense of puppyish charm. Two of the most striking characteristics of the new Aibo puppy are its OLED eyes which provide a surprising amount of character, blinking, looking around and closing sleepily before it takes a nap (or runs out of battery). Its tail is also impressively realistic, wagging in a variety of different directions just as you would expect of a real dog. Its slightly bumbling gait is rather reminiscent of a real puppy, struggling to gain balance on paws that are too big for its body. 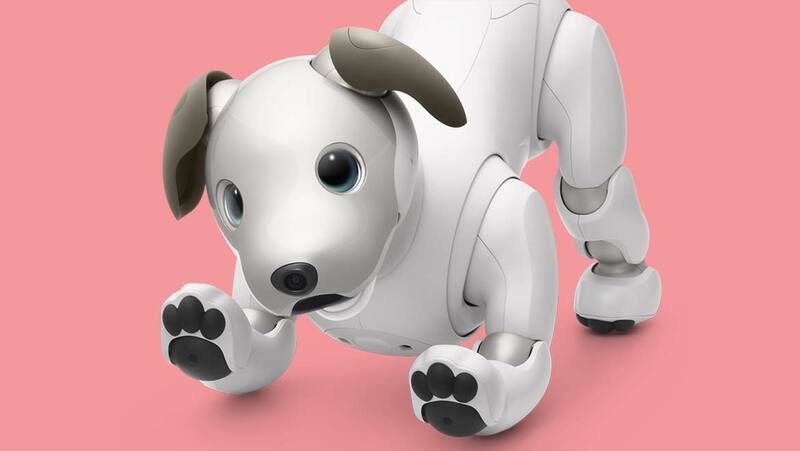 Aibo is powered by some impressive AI tech, with CNET reporting that Aibo can react to your voice and being stroked, as well as playing with toys, including the ball that comes as standard with purchase, and a specially adapted ‘bone’ which it can pick up and carry around. The AI capabilities allow each Aibo to develop their own personality, meaning that no two puppies will be quite the same. The associated app helps each individual puppy learn new tricks, whilst proud owners can access photos taken by their dog. Aibo might yet be released in other countries, although Sony have not announced any plans for this to happen just yet. If you’ve got your heart set on one of these robotic puppies though, you can expect that it’s going to cost you around the same as the most expensive pedigree pups, coming in at a price of $2,000. There is also a monthly fee of $25, required to keep your Aibo updated with all the most recent software and AI revisions. For those customers in Japan who pre-ordered their little Aibo puppies, they can look forward to receiving their pups soon after shipping on January 11.